Five Trumpet duets, written in the style of types of dances. 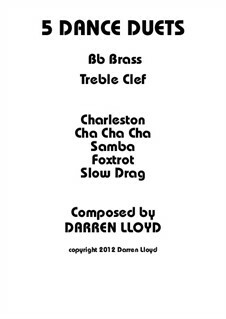 These include a Charleston, Cha cha cha, Samba, Slow drag (Bluesy) and a Foxtrot. The highest note in any of these duets is a top A. Most have a very comfortable playing range and are easy listening plus enjoyable to play. This book will challenge the intermediate Trumpet players.